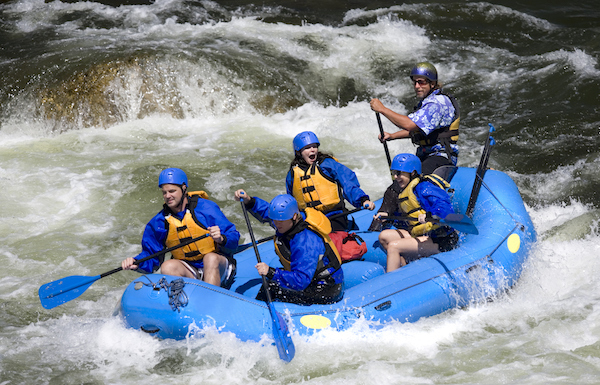 Whitewater rafting is one of Colorado’s top summer activities. And near Copper Mountain Resort, there are multiple rivers with great rapids for rafting, including the upper Colorado River, the Arkansas River, and Clear Creek. No matter what your level of experience, you can find an awesome rafting trip during your Rocky Mountain vacation. Brown’s Canyon is one of the best sections of whitewater rafting in America. Full of pool drops and fun waves, a run through Brown’s Canyon provides the perfect variety of exciting rapids and wilderness relaxation. We highly recommend Browns for visitors looking to experience a classic day on the Arkansas River. The Upper Colorado, known to locals as the ‘Upper C,’ is a fun section of river on the western side of Rocky Mountain National Park. Perfect for families, the Upper Colorado has calm water, mild rapids, granite canyon walls, and great wildlife viewing opportunities. During certain times of year when the water is low, there’s even a chance to swim in a natural hot spring. For those who want a real adventure, Clear Creek offers continuous rapids. Ranging from class II to class IV, this section also has lots of bighorn sheep and other wildlife, including muskrats, beavers, deer, bear, and sometimes mountain lion. 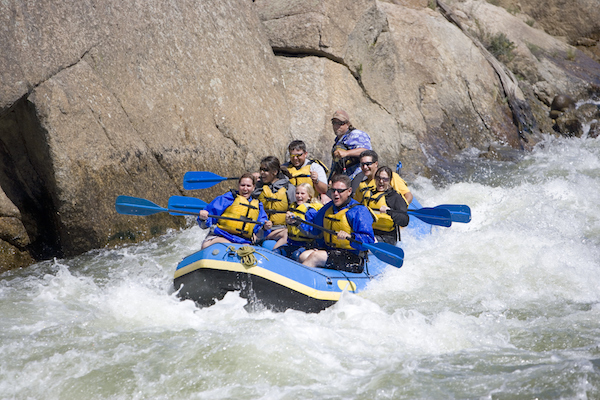 Beginning with Meat-n-Beef rapid and going onto Lumpy’s, Nomad, and Phoenix Holes, Clear Creek has many famous rapids and a long history of Colorado whitewater rafting. Spring is the time for big water in Colorado. After a long winter, the deep snowpack melts and the rivers and creeks are full of whitewater. During the late spring, you can enjoy great whitewater rafting conditions on many rivers and creeks near Copper Mountain Resort. We recommend wearing wetsuits as the water is quite cold. Whitewater rafting is the ultimate Colorado summer activity. On hot days, the cool water is refreshing, and water levels are mild and fun. Because the Arkansas river is dam controlled, runs like Brown’s Canyon are usually in form through August. Because Colorado whitewater rafting is fueled by snowmelt, fall is a slower time for rafting around Copper Mountain Resort, but there’s still plenty of ways to get out and enjoy. With the beautiful colors on the trees, fewer people on the river, and clear sunny days, a fall rafting trip is a great way to experience a special side of the Rocky Mountains. Yes, you read right. You can go whitewater rafting in the winter in Colorado. If you have a dry suit and are willing to break through icy banks, winter rafting is an interesting way to get away from the crowds and have a special day on the water. The truth is, however, we recommend skiing instead. Thanks for checking out the awesome whitewater rafting near Copper Mountain Resort. We love helping our guests get out on the river. For more information check out Kodi Rafting, a local Colorado company that offers over 30 trips on 5 different rivers.